Home > Blog > Product Updates & Releases > The Worlds most powerful Hot Saw! 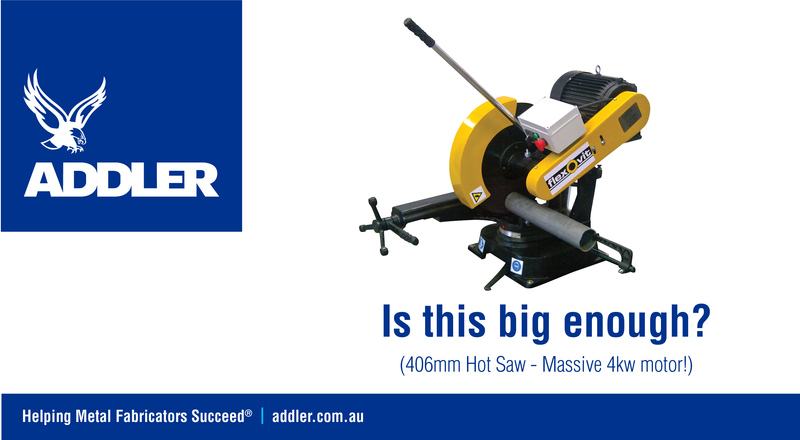 Are you looking for a Hot Saw with massive power and capacity? The Flexovit Hot Saw with its 4Kw motor and 406mm blade will not let you down! This Hot Saw is designed for cutting large steel tube, angle and bar. A quick clamp vice and rotating vice allow for fast setup and cutting at angles up to 45 degrees. Safety is paramount in todays working environment – and the Flexovit Hot Saw fits right in with its protective guarding and emergency stop switch. > The most powerful Hot Saw in its class! Product Updates & Releases Abrasives, ADDLER, Cutting Tools, Metalworking, Metalworking Machinery, Power Tools. permalink.